Perhaps Gov. 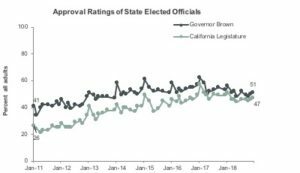 Jerry Brown’s most important contribution—reflected by the higher approval ratings for the executive and legislative branches—was to restore public confidence in state government. For most of the time since 2011, political gridlock stymied Barack Obama, Donald Trump, and Congress. But in California, Brown and the Legislature were solving problems. Survey results show that the public responded. Brown’s latest (and our final) approval rating stands at 51 percent. That’s 10 points higher than his approval rating in our January 2011 survey. Brown’s approval rating surpassed 60 percent twice—after his 2014 reelection and after Trump’s election, when our January 2017 survey had the governor at a 62 percent approval rating. Not surprisingly, Brown’s highest approval ratings today are among Democrats and self-identified liberals, 68 percent and 69 percent, respectively, and is least popular among Republicans at 18 percent and self-identified conservatives at 36 percent. Notably, his canoe theory of politics—paddle to the left, and then paddle to the right—seems to have worked well. About half of independents and moderates approve of the governor. Brown’s approval rating has never dipped below 47 percent since the voters passed his Proposition 30 tax increase in October 2012. The recent campaign for the Proposition 6 gas tax repeal and the race for his successor apparently had no effect on Brown’s popularity. Brown navigated through troubled fiscal waters that damaged other political careers. The approval rating for Gray Davis hit 31 percent in the September 2003 PPIC survey as he faced the recall that ended his time in office. His replacement, Arnold Schwarzenegger, had a 25 percent approval rating in the November 2010 PPIC survey, as the state suffered from massive budget deficits and he and the Legislature struggled with unpopular spending and tax decisions. The Legislature had been mired in low approval ratings for years. Perhaps the Legislature rode the coattails of Brown’s success—its approval rating increased by 21 points, from 26 percent in the January 2011 PPIC survey to 47 percent in December. California’s fiscal recovery was certainly tied to more positive views of the governor and Legislature. The perception that the state budget situation “is a big problem” fell by 25 points, from 68 percent in January 2011 to 43 percent in January 2018. At the same time, during Brown’s time in office, the belief that the state is generally going in the right direction grew by 16 points to 54 percent in December 2018. Brown and the Legislature took the drama out of the annual budget process, passed popular laws on education funding and climate change, responded to crises such as drought and wildfire, and maintained a united front against Trump’s unpopular policies. Will Brown be a hard act to follow for Gavin Newsom? Maintaining fiscal stability and an effective partnership with the Legislature will be the key ingredients. Jerry Brown will be leaving office with Californians in a better state of mind than they were in eight years ago. His tenure offers a successful model for governing the state in the future. Mark Baldassare is president and CEO of the Public Policy Institute of California, [email protected] He wrote this commentary for CALmatters.